Recent developments in the industry of kitchen sinks have created innovative products with a lot of applications in addition to traditional construction purposes of foundations and slabs. 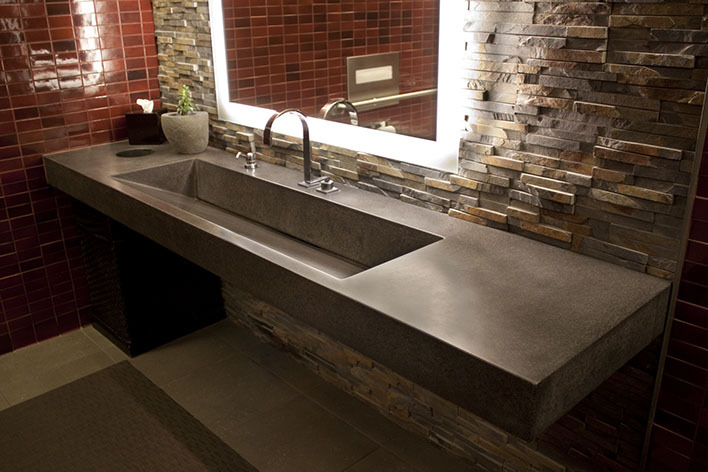 Concrete bars, sinks, and countertops are now made from durable material in ways which expand options greatly both for business and home applications. The versatility of concrete gives it options which are not available with materials of stone that are used for the countertops and other surfaces. Practically, any size or shape is possible with some that show the final installation. It is possible to have various edging styles with concrete, including those that are not limited to typical bullnose. Additionally, it is quite unique in the ability to accept inlays like colored glass or polished pebbles and to conform to an endless array of the configuration of designs. The price of concrete sinks per foot is less than natural stone and has the ability to imitate appearance, and improves with age as the patina develops to pleasing and warm tones. While colors are there in alternate materials, concrete does not depend on the color that is chosen by nature like in the case of granite. Any tone or color is there to match the interior décor or entertainment areas in the outdoor. Concrete sinks are functional in restaurants where cooking equipment may damage delicate surfaces of the materials used in their construction. After sealing the concrete, it possesses the ability to resist stains and water. A lot of factors combine to make the concrete preferred service materials for business and homeowners, interior designers, and architects. How are concrete sinks made? Concrete sinks are built either on a site or shop, depending on the requirements of the client and contractor. The advantage of working in the shop is the convenience of utilizing tables which support concrete in controlled environs. Additionally, the contractor possesses complete control over the sink while curing until when he applies the sealer. Reinforcing materials are always available in the shop or house for the purpose of providing the required strength in the concrete. Constructing on the site has so many advantages. The contractor will form a sink to the exact specifications of the client including forming radius edges and curved corners. If the walls of the home are not fully square, the contractor will adopt a shape that the contract will fit in the available space. Whether you choose to build concrete sinks in a shop or site, the procedure of making these sinks or countertops remains the same. The mix needs to include lightweight aggregate material, certain additives, and cement in addition to inlay elements desired by the client. Contractors have the choice of making the mix stronger when necessary, by altering amounts of various included materials. To give the final product the required support that will make it strong, the contractor begins the process by laying a bed of fiberglass, wire mesh, reinforcement material, and steel bars. You may choose to use more than on reinforcement for your project. The process of curing begins immediately the mix gets poured. The interesting fact about concrete sinks is that they get harder when curing and continues as they age. When the contractor realizes that the surface wants to accept the sealer, the right one is chosen. The contractor’s experience helps in determining the sealer type for every project. Every sink is the original creation that is not similar to another; therefore, it is appropriate for consideration to get into the sealer choice. In most kitchen projects, epoxy is chosen as a sealer. It adds the time needed for completing a project and adds to its pricing too, but the finish quality is very remarkable. The homeowner that desires uniquely serviceable and beautiful concrete sinks may satisfy the desire for durability and elegance with concrete. Granite, marble, and tile are usually used, but concrete provided superior options of design that are not available with the natural stone. Concrete also allows for the development of diverse thickness and shapes over a long period without seams. Stamps and stains make it look as if it is the stone that the client desired. The uniqueness of this product offers beauty that has lasting quality for long. Options available at http://www.customconcretetampa.com/ give the homeowner an endless array of colors, shapes, and design which make the kitchen truly beautiful and unique.